This is our best look yet at the new 2016 Aston Martin DB11. The artist's impression is published in the new December 2015 issue of CAR magazine - and it depicts the first new-era volume Aston to arrive under the watch of incoming boss Andy Palmer. You can read the mag story in full in our new CAR+ service here. Aston has already confirmed it will call its DB9 replacement the DB11, as long predicted by CAR magazine. It may dodge a digit - whither DB10? - but this continues an historical naming strategy that has seen other DB badges disappear over the years. See the freshly contoured DB11 badge that'll adorn the new GT's rump in our photo gallery above. The Aston Martin's DB9 successor is due in late 2016 and will usher in a new era for the company: for a start, it will be turbocharged - and the DB11 will use Mercedes-Benz electrical architecture, including S-class-sourced digital instruments and switchgear, as revealed in our recent spy photos (below). CAR magazine's spies have nosed inside the cabin and uncovered electronic dials taken straight from a Merc as well as a Comand interface rotary controller and switches for heating, chassis settings and more. Gaydon has already confirmed its partnership with Daimler would include sharing electrical architecture - long an Aston Martin weakness - and here's the proof. Note that this prototype has many Mercedes systems strapped in place, somewhat haphazardly in the case of the HVAC heating and ventilation switches lashed horizontally by the passenger's knee; we anticipate that in production they will be 'Astonised' to include bespoke British graphics, look and feel. But their origin is undisputably German. The latest photos come a few weeks after we published revealing spyshots showing a set of intercooler switches on a prototype testing in Germany (see picture below). A separate DB11 prototype was caught at a standstill and, zooming in, we noticed a bank of four toggle switches controlling the 'intercooler pumps' and 'fans'. Clearly these won't be fitted to production cars, but they are a sign that Aston Martin will turbocharge its V12 and V8 engines in the name of improved CO2 and economy figures. Paperwork left on display in the vehicle refers to the VH500 codename, confirming our belief that the new DB sports car will continue evolving Aston's VH aluminium architecture. CAR has compiled a detailed scoop dossier on the new DB11 sports car and we can confirm it will get Aston V12 power, turbos and a smaller V8 engine to swell the range. Although it is unclear whether these prototypes are a twelve or eight-pot, we expect both engines to feature forced induction. Our spy photographs from the Nurburgring capture the latest generation of prototypes; they contrast strongly with the earlier pictures in our gallery of development mules (check out the largely intact DB9 bodywork morphing into something more modern). Note also the widened track of the test hacks, suggesting the DB9 will be stretched to accommodate a broader footprint. All the better for Aston's traditional ground-hugging stance and handling, as well as a more spacious cabin to accommodate larger passengers. Aston isn't missing out on the skip-a-generation DB10 altogether; it's the hero car in new Bond flick Spectre, giving us a flavour of what to expect on DB11 before we see it in the metal at the 2016 Geneva motor show. But word is that the 007 car (below) gives only a partial steer on the DB11's likely wardrobe. What is known more firmly is the engineering basis for the new car. It will use the latest iteration of Aston Martin's VH aluminium architecture pepped up with the latest modules of everything: new suspension and transmission updates; the carte-blanche electrical systems from Mercedes-Benz including minor switchgear, sat-navs and digital dials; and, we hear, a smattering of lightweight composites. Aston has been quietly developing its knowledge of carbonfibre with models such as the latest Vanquish, One-77, Vantage GT3 and Vulcan. We expect more plastics to contribute to a hefty weight-saving on the next DB9. Moreover, we're also hopeful that the arrival of Matt Becker, Lotus's former chassis guru, will give the new GT the handling edge. 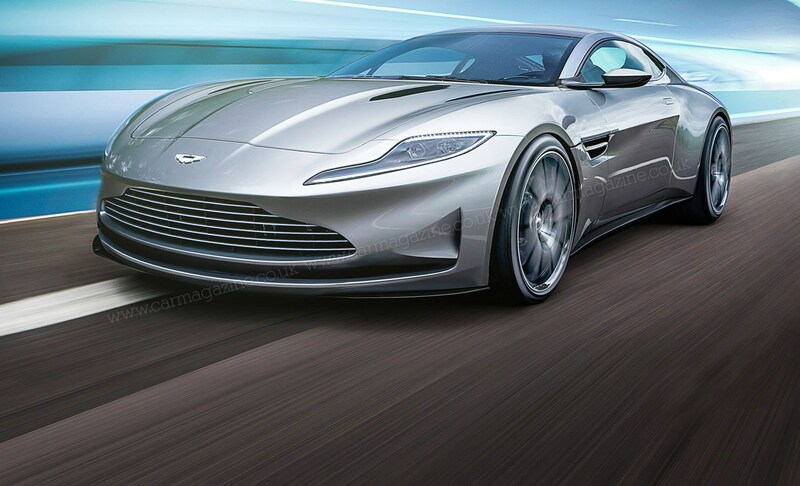 The big news is that CAR understands the Aston Martin V12 engine will continue. Aston has consistently used twelve-pots for its top-end cars and we hear the engine supply deal with Ford is continuing (the Blue Oval makes the 6.0-litre V12 in Cologne). What about the Mercedes AMG link-up? Aston Martin and Daimler have signed an engine supply deal in addition to the electrical architecture swap-shop, and the DB9 replacement and 2018 Vantage are expected to use AMG engines. It is understood to be a version of the 4.0-litre V8 you'll find in an AMG GT sports car and C63 AMG, although we know that Aston has been testing a variety of engines in its mules. CAR understands the Aston version will be turbocharged and tuned to produce a distinct power and aural delivery, to distance it from more common Mercs. Rear-wheel drive remains order of the day. Click here to find out what happened when CAR magazine ran an Aston Martin DB9 for a year.